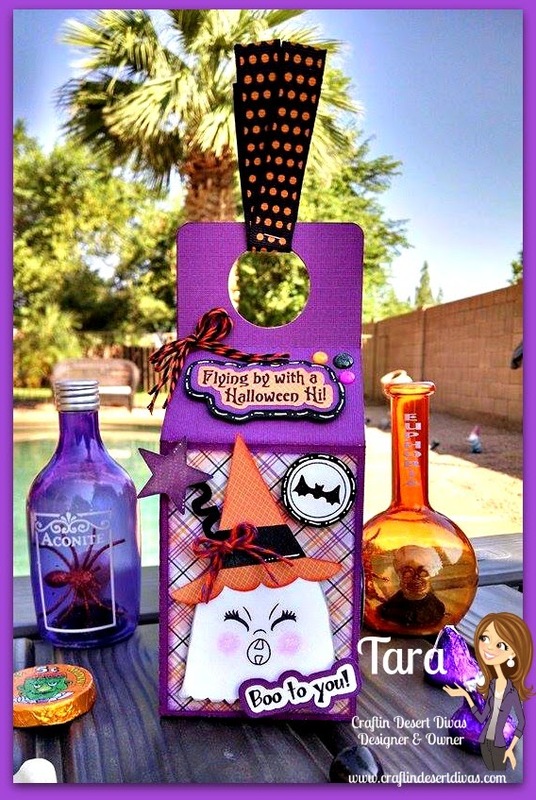 Hi everyone I wanted to invite you to The Boo Crew Halloween FB Hop. 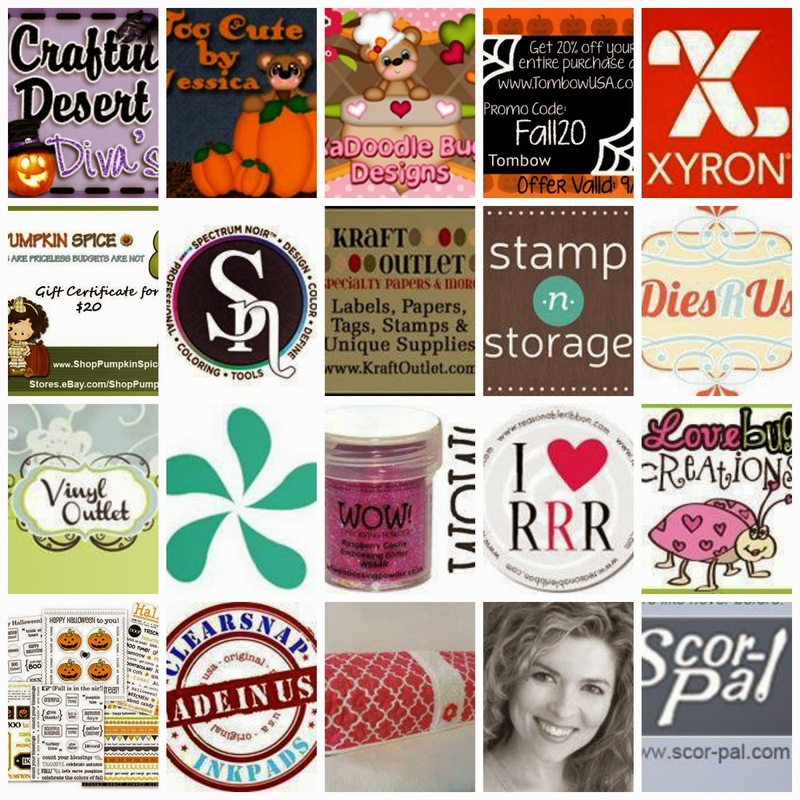 We will be showcasing Craftin Desert Divas Stamps, KaDoodle Bug Designs and Too Cute By Jessica patterns. Are you ready for a spooktacular hop? Our DT ladies have some frightfully cute creations to share with you. Of course our hop has some AMAZING sponsors! We have some freebie patterns too, you have to hop to find the link to the freebie patterns. CDD, KBD and TCBJ are all having SALES this weekend! There are also 2 special discount codes from Tombow & Kraft Outlet listed below to use during this hop. 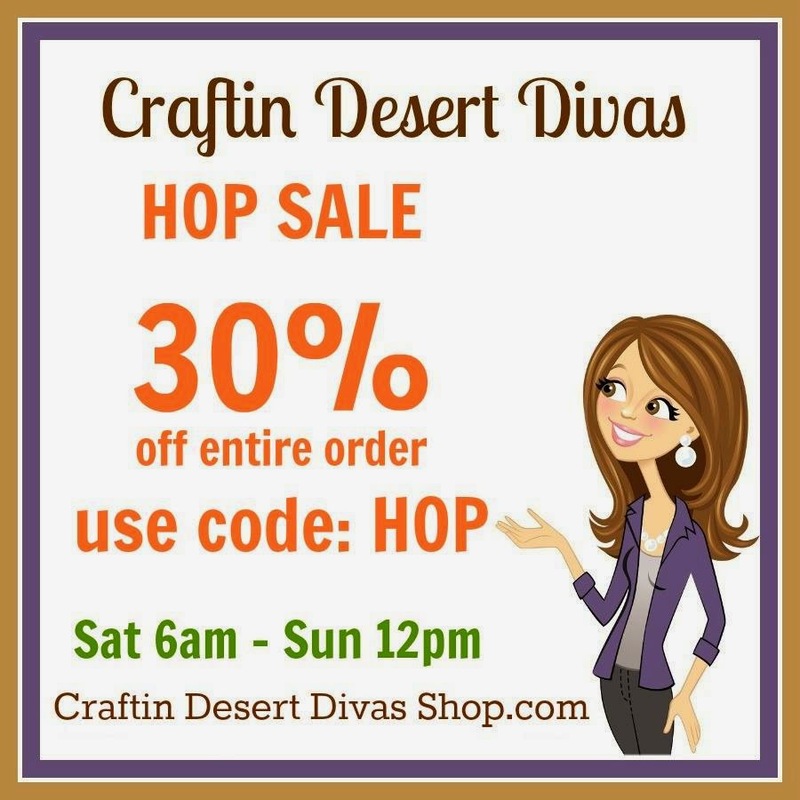 Craftin Desert Divas - One stamp set each day of hop. Xyron - 5" Create-a-Sticker Max valued at $28. Vinyl Outlet - Pack of vinyl for 3 Winners!! To win these prizes all you have to do is comment on the projects in the hop. We will pick winners from different FB pages. So the more you comment the more chances for you to win. We would love for you to "like" our FB pages, but it's NOT a requirement. We want you to enjoy this hop and join us for our future hops. This handled treat bag. I let my girls fill it with goodies and they are taking this in to their teacher. 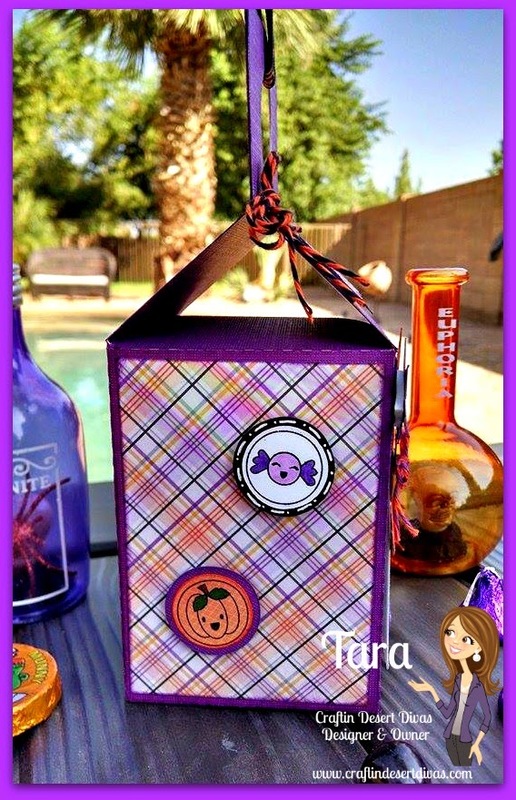 I used the Craftin Desert Divas Ghostly Greetings & Frightfully Cute stamps. I've also used the round images on the stamp set Ghostly Greetings to decorate the box too. Those images went perfect with my Witchy Ghost from KBD. As you can see for the sentiment on top I've cut out the SVG outline for it and then I did an offset to put colored layers behind it. I like how it makes the sentiment pop. To finish it off I added a PKS Zombie face to her and some Trendy Twine, Doodlebug Sprinkles to complete it. I'm having a 30% off SALE in the CDD Shop!!! So come on over to the CDD FB PAGE and hop with us! Be sure to come back tomorrow all starting here again for Day 2!!! Comment and Thank all the wonderful sponsors!!! Winners announced Monday on the CDD Blog. Omg this is too cute . I love this!! What a great treat box!! Love the Halloween container. Your daughters teachers are really going to love these goodie bags. This is adorable.. great project. 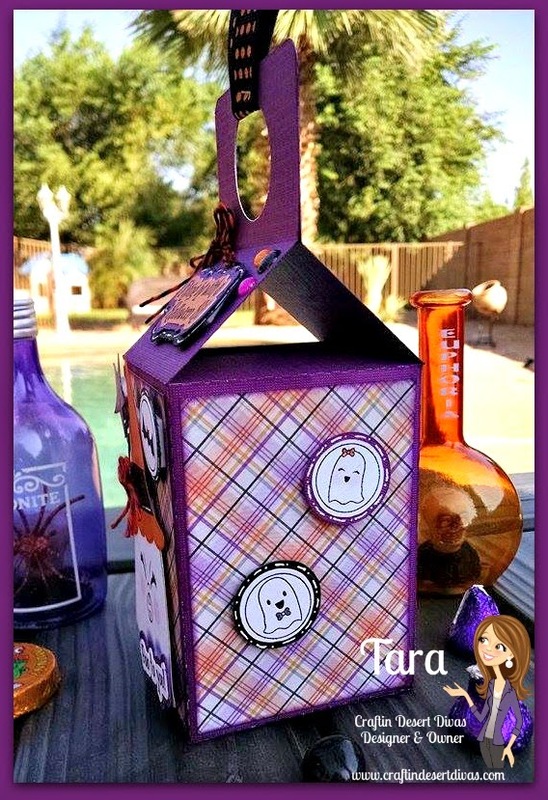 Oh wow, your treat container looks amazing, Tara!! I love the face on the ghost!! The stamps are all fabulous!! Off to hop!! awesome and adorable... I am on the hop... and darn. I just ordered stamps and I didn't see the sale...LOL, guess I can order a few more. Super cute, love the colors and the face!! Really cute stuff. Excited to shop, watch your blog and get ideas from you in the future. LOL love the face on the ghost. The triple layered sentiment is awesome as is the shading around the edge of the patterned paper. Super cute!